(Nanowerk News) Electronics is based on measuring the tiny electrical charge of electrons passing through electronic circuits. An alternative approach under development is spintronics, which instead relies not on electrons’ charge, but on another of their fundamental quantum-mechanical properties: spin. Spin can be visualised as the Earth turning on its own axis while rotating around the sun. In the same way, an electron spins on its own axis while rotating around an atom’s nucleus. Spin is either “up” or “down”. In the same way traditional electronics uses charge to represent information as zeros and ones, the two spin states can be used to represent the same binary data in spintronics. Spin can be measured because it generates tiny magnetic fields. Ferrous metals such as iron become magnetic, for example, when enough particles have their spin set in the same direction, generating a magnetic field of the same polarity as the spin. Spintronics has several advantages over conventional electronics. Electronics require specialised semiconductor materials in order to control the flow of charge through the transistors. But spin can be measured very simply in common metals such as copper or aluminium. Less energy is needed to change spin than to generate a current to maintain electron charges in a device, so spintronics devices use less power. Spin states can be set quickly, which makes transferring data quicker. And because electron spin is not energy-dependent, spin is non-volatile – information sent using spin remains fixed even after loss of power. The first application of spintronics to computers saw Professors Albert Fert and Peter Grünberg awarded the 2007 Nobel Prize in Physics for their discovery of giant magnetoresistance (GMR). They realised it was possible to use electron spin to increase the rate at which information could be read from a hard disk drive and developed ground-breaking technology to harness this feature. A hard drive, showing circular platters and read/write head mounted at the tip of the arm. 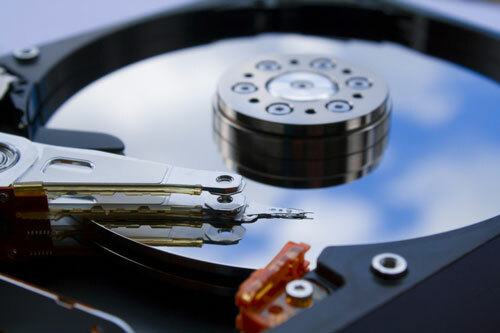 A hard disk drive stores data as ones and zeros encoded magnetically on rotating disk platters within the drive. The magnetic field is generated when electrons flow through wire coils mounted in the drive write heads which move across the face of the platters, changing the alignment of the magneto-sensitive particles on the platter surface. Reversing the electron flow reverses the field; the two directions represent one and zero. To read from the disk the process works in reverse. A GMR drive head consists of two ferromagnetic layers, one with a fixed magnetic field direction and the other free to align with the magnetic field encoded on the disk, with a non-magnetic layer sandwiched in between. When an electron passes through a magnetic field its spin state may change, known as scattering. Where electrons have random, scattered spin states this creates greater resistance to electric current. 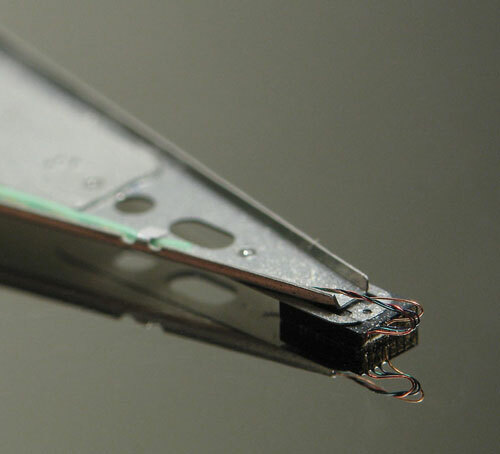 By aligning electrons’ spin state to that of the magnetic field in the layers of the drive head, GMR technology dramatically reduces resistance, speeding up data transfer. First introduced by IBM in 1997, GMR technology has led to faster and higher-density drives than was previously possible. A hard drive read/write head. Spintronics researchers have since been working on introducing the same technology to computer memory, aiming to replace electric current-based dynamic random access memory (DRAM) with magnetic RAM (MRAM). The first commercial product by Everspin has been used in Airbus aircraft and BMW motorbikes due to its reliability under heat stress or cosmic-ray exposure – something that affects aircraft cruising at high altitudes. MRAM exploits the same spin-based magnetic field approach, but uses a magnetoresistance cell to store data rather than a spinning disk platter as in a hard drive. While it is not as fast as DRAM, magnetic cells are able to maintain their stored spin orientations, and so the data they represent, without power. MRAM is likely to replace commonly used flash memory such as SD cards and compact flash first, as it is faster and doesn’t suffer from flash memory’s limited lifespan. Other manufacturers such as Intel, Qualcomm, Toshiba and Samsung are developing MRAM to use as processor cache memory, where by virtue of their smaller size MRAM chips of greater capacity can be incorporated into smaller packages that will be faster, and use up to 80% less power than current cache memory. As electronics approaches the limits of silicon, spintronic components will play an important role in ensuring we enjoy steady performance gains, and faster, higher-capacity storage at lower power and cost.